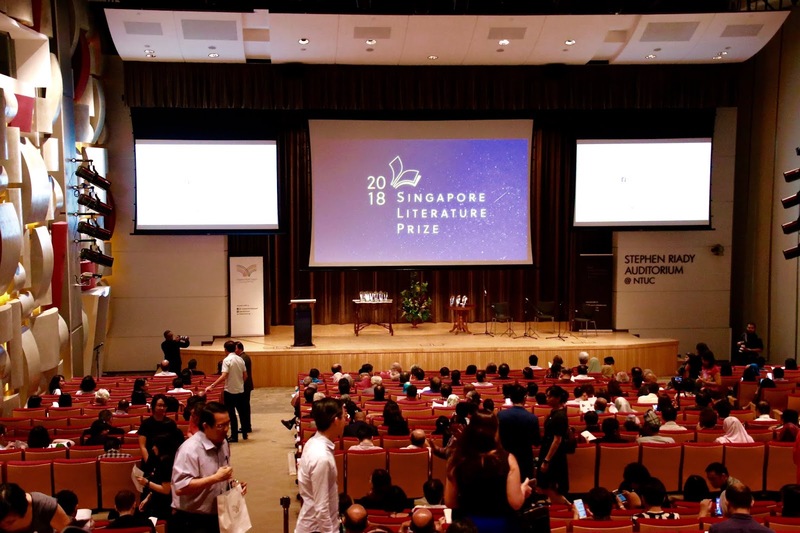 A couple of things to mention before we go through all the categories: The Singapore Book Council is under the new helmsmanship of William Phuan, who has a background in film (he was Programme Director of the New York Asian American International Film Festival) and arts policy, particularly in promoting translations and intercultural work through The Select Centre, which he co-founded. Multiculturalism is lauded here, and it's wonderful to see the 'big-up' given to Tamil poetry, fiction and creative non-fiction (being the only language I can't access, I wishfully had the thought that perhaps in the future we could also read them in translation!). Prizes often have statements from judges as to the criteria for selection, or why they particularly gravitated towards the winning volume (we don't have the same process here). Chua Chee Lay, Melody From Foreign Lands, Lingzi Media. Denon Lim Denan, If There Are Still Fireflies, Lingzi Media. 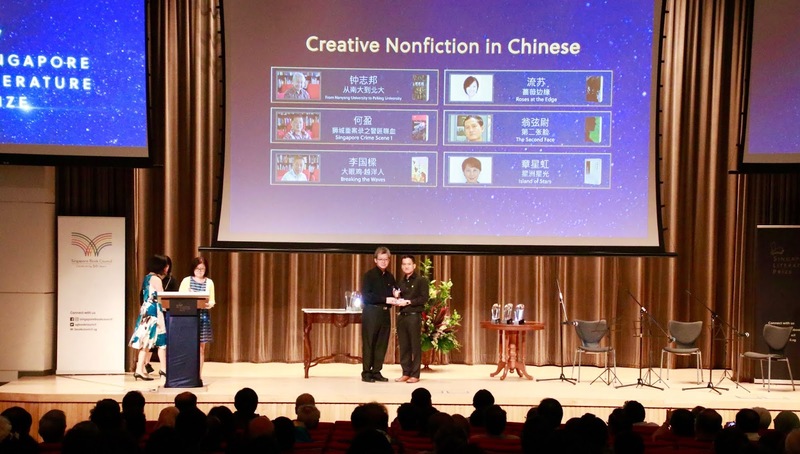 Lee Hock Ming, Delights of Poetry, Singapore Association of Writers. 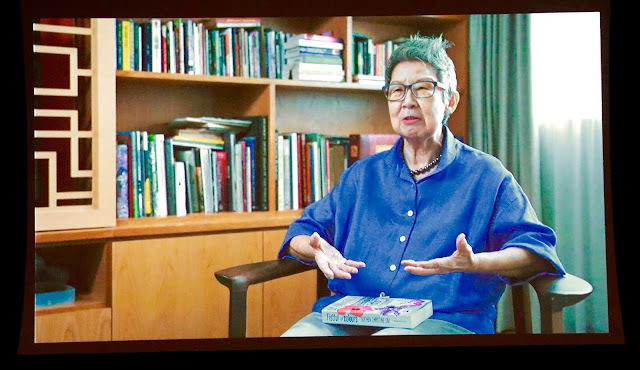 Tan Chee Lay, Landmark Poetics of the Lion City, City Book Room. Amanda Chong, Professions, Math Paper Press. Euginia Tan, Phedra, Ethos Books. Loh Guan Liang, Bitter Punch, Ethos Books. Samuel Lee, A Field Guide to Supermarkets in Singapore, Math Paper Press. Theophilus Kwek, Giving Ground, Ethos Books. A K Varadharajan, Lee Kuan Yew Imaginary Childhood, Self-published. M Segar, Ravana's Seethai, Self-published. Farihan Bahron, Finger-Pointing Expert, Unggun Creative. Peter Augustine Goh, The Well of Truth, Dewan Bahasa and Pustaka. Yazid Hussein, Murad is Dead, Self-published. Choong Chee Pang, From Nanyang University to Peking University, Lingzi Media. Ho Yuen, Singapore Crime Scene 1, Lingzi Media. Lee Kok Leong, Breaking the Waves, Traveler Palm Creations. Liu Su, Roses at the Edge, City Book Room. Weng Xian-Wei, The Second Face, Global Publishing. Zhang Xing Hong, Island of Stars, Global Publishing. Charmaine Chan, The Magic Circle, Ethos Books. Charmaine Leung, 17A Keong Saik Road, Ethos Books. Melissa De Silva, 'Others' is Not a Race, Math Paper Press. Nirmal Ghosh, Unquiet Kingdom: Thailand in Transition. Shubigi Rao, Pulp:A Short Biography of the Banished Book, Rock Paper Fire. Tjio Kayloe, The Unfinished Revolution: Sun Yat-Sen and the Struggle for Modern China, Marshall Cavendish Editions. Bala Baskaran, G Sarangapany and the Tamil Murasu: A Current Appraisal, Self-published. M Segar, Words and Thoughts, Self-published. Ahmad Bin Md Tahir, Colour of Expression, Self-published. Sharifah Mohamed, Author's Lab, Self-published. Lee Chuan Low, Rescue Frontline, Lingzi Media. Lin Gao, Life Between Frames, Lingzi Media. Xi Ni Er, The Floating Republic, Lingzi Media. Zhang Hui, Smoker Memories, Society of Literature Writing. 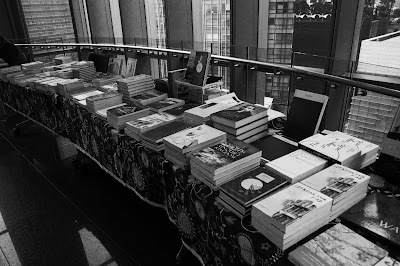 Li Qing Song, Manuscript -- Collection of Short Stories, City Book Room. Balli Kaur Jaswal, Sugarbread, Epigram Books. Jennani Durai, Regrettable Things that Happened Yesterday, Epigram Books. 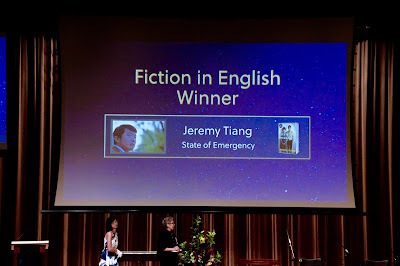 Jeremy Tiang, State of Emergency, Epigram Books. Nuraliah Norasid, The Gatekeeper, Epigram Books. Wong Souk Yee, Death of a Perm Sec, Epigram Books. 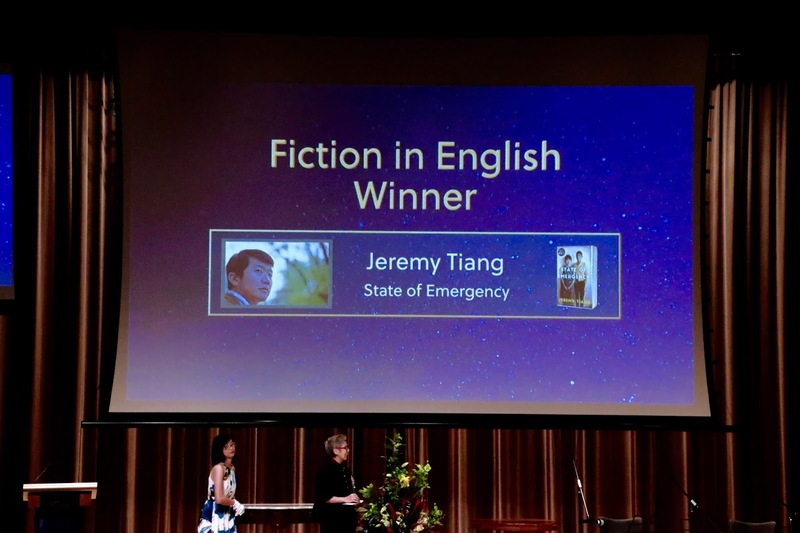 Jeremy Tiang couldn't attend, so publisher Edmund Wee accepted on his behalf. Chitra Ramesh, A Drop of Happiness, Self-published. M K Kumar, 5.12 pm, Yaavarum Publishers. Preemie Mahalingam, Water Droplets, Aaria Creations. Adam bin Fadila, Muezzin in Search of Light, Self-published. Djohan A Rahman, When The Alphabets Dance, Mini Monsters Limited. Farihan Bahron, Avatar's Wrath, Unggun Creative. Hassan Hasaa'Ree Ali, Souvenir From Space, Kopi Ceta Sdn Bhd. Congratulations to all winners and shortlists! Re: the importance of Singlit: "Who would read or write us, if we don't read or write about ourselves?" -- Suchen Christine Lim. Every country needs its own literature. -- Yeng Pway Ngon. Literature is a way to open conversations and share different perspectives in a multicultural society. -- Claire Chiang, Chairperson of Singapore Book Council.